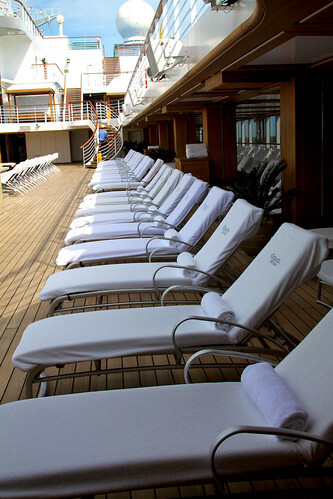 Carnival’s 40-minute holding limit will extend to all ships after a successful test run, but it’ll take several months to assess the long-term practicality of using staff as lounge chair watchdogs. Cruise giant Carnival is expanding its crackdown on “deck chair hogs” — passengers who save deck chairs on ships for hours without using them. The pilot program was tested on the 3,690-passenger Carnival Breeze in July. Photo by Victoria Herring. The world’s largest cruise line says a much-publicized pilot program to eliminate the practice launched in July on the 3,690-passenger Carnival Breeze was a big success, and it’ll be rolled out fleetwide over the coming weeks. “It has been a subject discussed over and over again, and it has been so because it continues to be a concern,” Carnival senior cruise director John Heald wrote on his Facebook page in July.